Film-Tech Forum: Drive-Ins & 70mm: Has anyone actually done it? Author Topic: Drive-Ins & 70mm: Has anyone actually done it? Curious about this. I searched through F-H-F, found some threads that discuss the theoretical advantages of using 70mm in a drive-in (for better light). But I can't find any claims to have actually done it. There was someone in Australia who said his drive-in is 70mm equipped, but no mention of actually running anything in 70mm. Australia and Brazil had a few 70mm capable set-ups. Yes, one of the drive ins in the twin cities ran 70 on occasion. Rumor has it that the projectionist had to wear sunglasses as the reflection from the liscence plates was blinding Sadly, the drive in is now a Kameapart. It was very common here in the late 50's and early 60's. I don'tknow how many of them actually ran 70mm prints...I suppose a few did but alot of them were very well equipped. There were a few with 150 foot wide screens! The North Star in Denver had a 150 footer, and one in Rhode Island did that probably took up almost the whole state. I'm sure that taxed even the 70mm prints to the max. They often used Strong Jet Arc lamphouses that were larger than the Norelco DP-70's that graced many of the booths. Aboput the size of a large washing machine turned on its side if you can imagine a lamphouse that big. These made Ashcraft Super Cinex's look small. 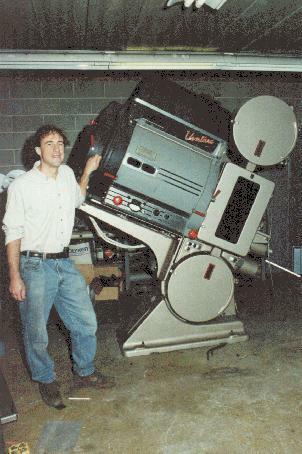 A few were equipped with Bauers and a few with Cinemecannicas. I can scan a few photos from old International Projectionist mags and send them to you if you'd like to see. Here is a Strong Jet Arc, in this case with its OEM National Cinema Supply "Vent Arc" labeling. That's owner James Bond of Chicago's Full Aperture Systems with it. In Las Vegas, the Sunset drive-in was equipped with JJs--don't know if they ever actually ran 70mm though. Steve, don't you think it would be better if that projector pointed straight down at the floor? You can never have enough keystoning. Was that from a drive in? Was the projection booth 20 stories up? It seems odd that there would be a drive in with the screen BELOW the booth. Of course it really doesn't look like a booth so what do I know? Joe, that machine you are looking at is in James' BASEMENT. And of course, it was not in 'operational' status at the time. I too heard of a drive in in SoCal that apparently ran Cinerama. When I went to Dayton, OH. several years ago to see the Cinerama films at the New Neon Theatre the Lowell Thomas B&W 1:33 section at the beginning was actually spliced onto the beginning of the film and not run from a seperate booth like I saw in Boston. I talked to John after the showing and I believe he said they found that reel at a drive in in SouthCal. They brought those prints to Seattle a couple of years ago to show at Seattle's Cinerama Theatre during a film festival and it was so busy and hectic I never got the chance to ask John where that portion of film came from. I worked a drive- in in a suburb of Portland, OR. one summer and they had a mag-only print of the Brando version of MUTINY ON THE BOUNTY. Their house projectionist had to install mag penthouses to run that film, apparently because the distrib could not come up with a mag/optical print. WOW! Thanks for that picture, Steve. God, that's one awesome piece of equipment! Ah, the romanticism of arc light. No doubt that baby has to be water cooled, no? What amperage does it run at? And are the carbons the size of Hulk Hogan's legs? I don't want to see what a reel of film looks like after passing through THAT aperture. Bet there was a lot of scorching going on with those drive-in prints. I believe that was just a test to see what the maximum downtilt could be. As you can see it's just in the warehouse; not a booth. Frank: On the Jet Arc (so named because a blower forces air through small nozzles that shape and constrict the arc plasma), the negative is not a carbon at all but actually solid graphite. Looking this up in the old SMPTE book, the positive was 10 or 11.5mm, non-rotating, and the lamps ran at 140-155A. Union Carbide (National Projector Carbons) experimented with carbon arc lamps that produced up to 42,000 lumens open gate. For example, an experimental 11mm "Ultrex" positive carbon ran at 195 amperes and 80 volts (15,600 watts) with a f/2.0 mirror system. The largest was a 13.6mm "Ultrex" positive operating at 290 amperes and 80 volts (23,200 watts) with a f/2.0 condenser lamp. Don't know if these lamps were ever commercialized. Buffalo NY had a drive-in equipped with 70mm Norelco projectors. It was the I-290 (it was located near that Interstate highway, just north of Buffalo).